Join us this Saturday, May 12th as we put our hands to the ‘āina to mālama ‘Aimakapā. 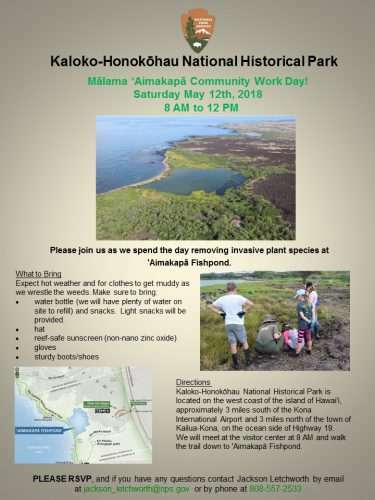 For this workday, we plan to pull weeds from the muddy wetland as well as the removal of non-native invasive vegetation from the dryland areas surrounding the south shore of the fishpond. Please RSVP to Jackson Letchworth (jackson_letchworth@nps.gov) if you plan to attend. Mahalo!